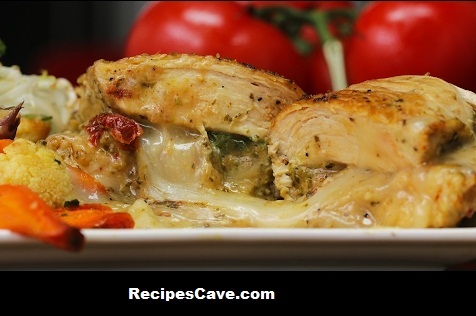 Pesto stuffed chicken recipe - Best chicken recipe for vegetarian people this is pesto stuffed chicken recipe just simply follow the bellow steps. On a cutting board, salt and pepper both sides of each chicken breast with approximately ½ teaspoon salt and ½ teaspoon pepper, per side. Slice each chicken breast horizontally along the side to create a pocket for the filling. Stuff each breast with approximately one ounce of mozzarella cheese, one tablespoon pesto and four sundried tomatoes. If the chicken breast does not close fully with the filling, try securing with a wooden toothpick. Pan fry for about 5-8 minutes, per side, depending on the size of the chicken breasts, until the cheese is melted and the chicken is cooked through. Your Pesto Stuffed Chicken Recipe is ready to taste.